Some fall outfit inspiration for your Wednesday morning! Thanks for stopping by! Great fall look! I love your style! Love those lace up flats and the fringe bag! Great fall picks. I love your picks! This is definitely an outfit I can see myself wearing! This watch just went to the top of my Fall shopping list! Hi Rach! Lovely picks. I have a crush with that sweater, It looks so comfy and cozy! Also, the flats are adorable and I love the color, super versatile!! Loving this look, those shoes are so cute!! Love the handbag and the purse! Great picks, Rach! I love those shoes and skinny jeans, such a great combo! Those glasses and that bag! LOVE! Loving the whole outfit!! Great sunglasses and flats! I’m loving this outfit idea, Rach! 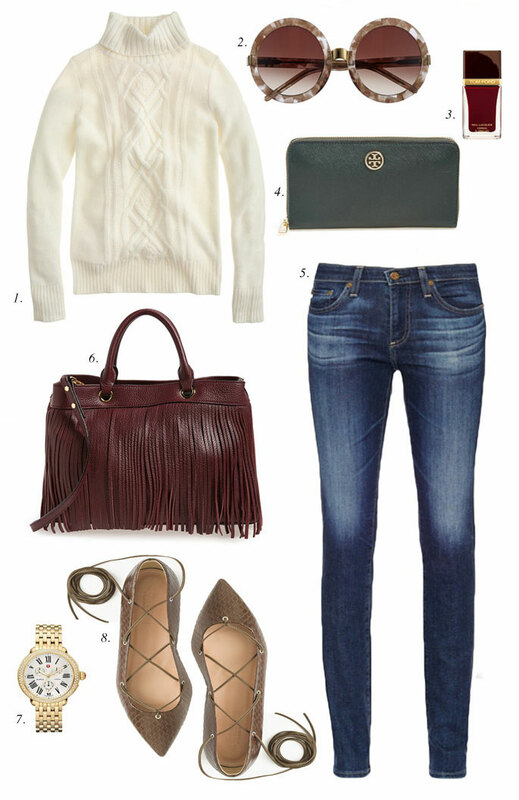 That purse is gorgeous, I love the color and the fringe detail, perfect for fall! I hope you’re having a wonderful day so far! That sweaters looks so nice and cozy! lovely cannot wait for chunky sweaters! Great fall outfit inspiration, love the shoes and nail polish! Loving this ensemble! Everything is so on point for this fall. Each piece would work with so many different looks. Loving the olive, the fringe on the bag, and the sunglasses! Yes to that chunky knit! Similar to a chunky knit we have as a part of our new collection. Check it out and let us know what you think! Love the sunnies bag and nail polish! Great combo! I love these fall hues. I love how all of your picks are so on point! This outfit is simple and chic. I like how you chose the red and green! Those shoes are amazing and I’m loving those sunnies! They are so fun!